Pathogen Perspectives: Ebola Unburied: Does Improper Burial of Ebola Victims Leave Communities at Risk of Exposure Through Dogs? Ebola Unburied: Does Improper Burial of Ebola Victims Leave Communities at Risk of Exposure Through Dogs? The Ebola epidemic in West Africa has taken a gruesome turn as we learn of dogs digging into fresh, shallow graves to partake in an Ebola feast. But what does this mean for those in the community and what does it mean for the dogs? This story actually didn't surprise me. In the 2001-2002 Gabon Ebola outbreaks, when dogs were tested, a whopping 30% were seropositive for Ebola. Let me take a minute to explain exactly what that means. 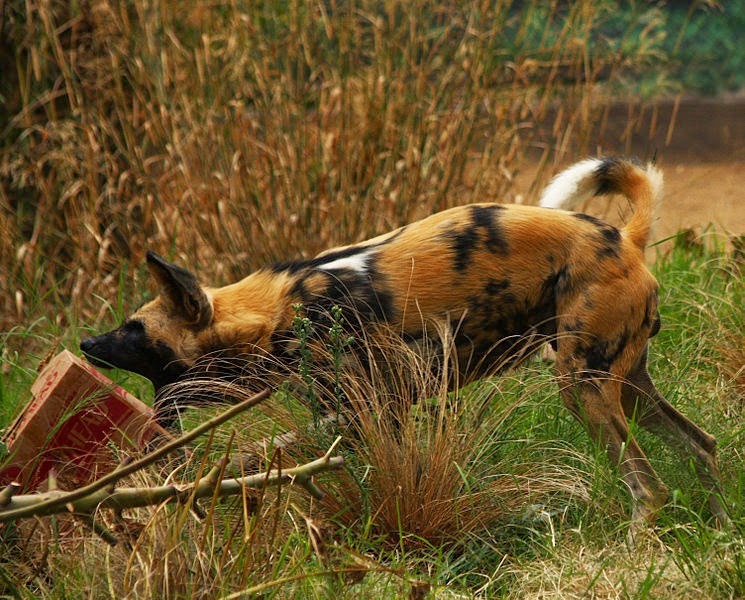 "Seropositive" means the dogs had antibodies against Ebola in their blood. Antibodies are proteins made by effector B cells, (plasma cells). B cells are white blood cells that develop into effector B cells/plasma cells when needed to make antibodies. Antibodies recognize a part of a foreign body like a virus, and target it for destruction. This part they recognize is the "antigen" or "antibody generator" and it provokes an adaptive immune response, AKA the antibody response. Antibodies can be made to order, in response to specific antigens, therefore their role in immunity is considered "adaptive". 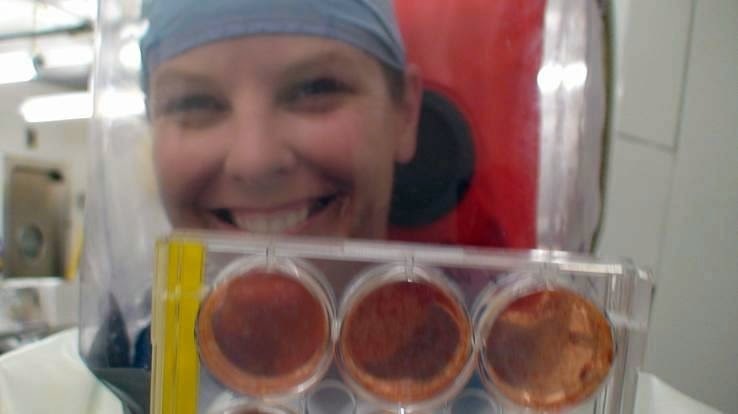 OK, so when there is Ebola in your blood it is recognized as foreign and antibodies are generated to get rid of it. Blood tests can be done to detect either the Ebola antigen, or antibodies against Ebola. When antigen is detected, it means there are virus particles in the blood. When antibodies are detected it means the virus had been there and an immune response was mounted. 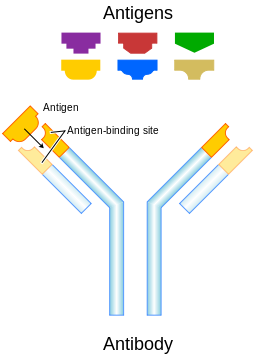 When an antibody encounters it's antigen, it will bind to it, making both undetectable to the blood tests. Early in an infection the number of antigen molecules will be greater than the number of antibody molecules, so all the antibodies will be bound to antigen and there will be excess unbound antigen. This excess unbound antigen will be detectable by blood tests and it will indicate that there is virus in the blood. As the fight rages on, there will come a point, hopefully, where there are more antibodies in the blood than antigen, and the reverse will happen: all the antigen will be bound to antibodies and there will be excess antibodies in the blood. At this point the antibodies will be detectable. This point is called "seroconversion" and the blood test will indicate that there are antibodies and therefore be "seropositive". At the early stage of seroconversion, when the amount of antibody and antigen are nearly the same, it's possible that there won't be enough of either unbound, for detection. This can lead to false negative blood tests. This period is called the "window period". OK. So now we know that there were dogs that were seropositive during the Gabon outbreak, so they had Ebola antibodies in their blood and thus had had Ebola virus in their blood. In other words, the dogs had been infected and lived. In fact there was no evidence that the dogs showed any symptoms. Considering that the likelihood of a dog feasting on a non-human primate that had died of Ebola in the forest is pretty good, it's not surprising that they would have antibodies in their blood. It's important to note that in this study, they were not able to detect viral antigen in the blood and they were not able to isolate virus from the blood. This suggests that the dogs were infected and fought the infection without symptoms and without acting as an amplifying host. An amplifying host is an animal in which an infectious agent can reproduce to high numbers. Without a lot of virus in its system, a dog wouldn't be able to transmit Ebola. So what does it mean for the people and dogs in this community in which the dogs are digging up shallow corpses? Well, first and foremost it means the people in the community have to live through a horrific nightmare as their loved ones are unburied and the fear of exposure increases as someone has to handle the bodies and properly rebury them. But does it mean the dogs can infect people? Well, based on the information we have, I don't think it's likely that dogs are reservoir hosts. However, It would depend on many factors like how much virus is in the blood and bodily fluids of the dog before it seroconverts. And certainly, if there is fresh bodily fluid or tissue on a dogs muzzle or paw it could infect someone it touches. Now how long that would remain a genuine threat, I don't know. Again it would depend on factors such as whether or not the dogs muzzle/paw was washed off in puddles or streams etc. Because it's a relatively unknown factor in transmission, and because it's not worth the risk in an epidemic already out of control, while sad, I think putting down the dogs is a wise move. Here's hoping they will have the wisdom and the manpower to bury the deceased properly from now on. Yet another good, informative post!